The smoky tomato sauce has a hint of cocoa for a deeper, richer flavour. But don’t worry, it’s not too spicy, so it’s cool for kids. Preheat the oven to 200°C, gas mark 6. Wrap the tortillas in foil and place in the oven for 15 minutes to warm through (according to pack instructions), while you make the sauce. Heat the oil in a medium sized saucepan and gently fry the onion for 4-5 minutes until softened. Add the garlic, paprika, passata and cocoa and simmer gently for about 10 minutes. Tip half the sauce into the base of a large, shallow, oblong ovenproof dish. Assemble the 8 enchiladas by putting a little bit of chicken in a line down the centre of each tortilla, together with some sweetcorn and a sprinkling of cheese (reserve a little to use as topping). Roll up each tortilla, tucking in both ends when rolling, and place in the dish seam-side down. 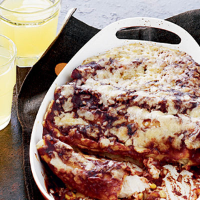 Pour over the remaining enchilada sauce and scatter with the reserved cheese. Place in the oven for 10-15 minutes until the cheese has melted and the sauce is bubbling. Serve with soured cream, salad leaves and cucumber slices. If short of time, try using Waitrose Tomato and Herb Pasta Sauce, instead of making the enchilda sauce. Our children’s recipe cards provide 50 per cent or less of the Guideline Daily Amount (GDA) of calories, fat, saturated fat, salt and sugar for children aged 5-10 years.